I've been in touch with Lenovo and asked them to make this right. To their credit, the support rep I spoke to understood that this isn't cool - and was very surprised about the issue. They immediately took detailed notes, got all my details, and escalated to customer care. The customer care person didn't really get it, but did take it seriously, and said they'd look into getting me a replacement compatible card at Lenovo's cost (lucky I don't need this specific one for app compat!) and getting the website fixed. Whether it happens, well, we'll see. Meanwhile, Lenovo continue to justify this practice when it comes up with the claim that "every manufacturer does it" even though neither Dell nor Acer seem to; unsure about others. I've explained that their options to make it right are in two parts: make it right for me, and make sure it doesn't happen again. Refund me and let me return the laptop so I can buy from someone without the restriction. (I don't actually want to take this option because all laptop makers are equally evil, and in all other ways the T420 is great.). Replace my T420 with an equvalent T430 with Lenovo brand 3G. Yup, that'd probably calm me down plenty. 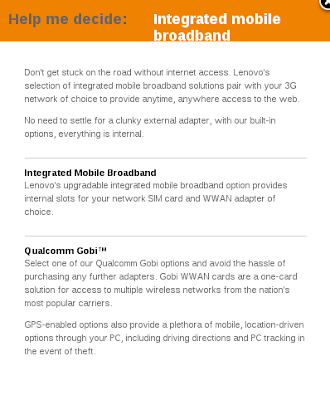 Add a link beside all "3G ready" or "mobile broadband ready" text in the shop and sales documentation explaining that only Lenovo brand cards are permitted. Update the laptop spec page for the mini-pci-E and wifi to note the restriction there. Agree to swap cards or issue custom firmwares for people who're bitten by this who bought before the shop was fixed. I give myself about 90% on getting it fixed for me because I'm quite happy to go to small claims about this and I have written records. As for the second part: I'm persistent, and I'm very, very angry. PostScript: Here's the chat log I got yesterday when - as an experiment - I tried an online sale person to see if I'd just been unlucky when I was assured by the (much more competent but harder to copy and paste) phone sales and support people that it isn't a problem. It's pasted from the chat window. I have screenshots too. I've masked the rep name from the log for obvious reasons. Thank you for contacting Lenovo Sales Chat. My name is xxxxxxxxxxxx. Happy to help you today. Hi. Sorry to trouble you, but I'm about to order a T420 I've saved in my cart and I have one final thing to clear up before I order it. 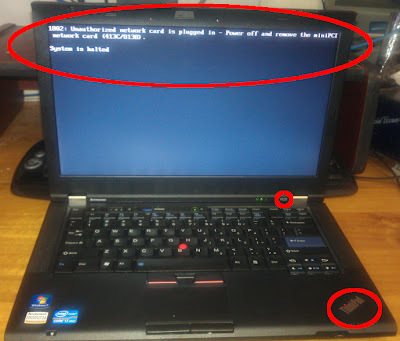 I've been told that Lenovo laptops (and IBM laptops before them) used to refuse to start up with a BIOS error if you put a 3G or wireless card in them that wasn't made by Lenovo. I have a 3G card from my Dell I want to use in my new laptop. I can take care of the drivers, etc, all I need to make sure of is that the Lenovo won't actively refuse to start up with the 3G card installed. You can go ahead and place the order. That issue could be a customer review, that must not be a problem with the machines these days. It says "All Thinkpads" are affected. That's not good. As the information is updated 1 year ago. No worries, I'd rather be sure. I'll call them. This sort of thing is a real and general problem in our chips-in-everything replace-not-repair world where the encryptors have a decisive advantege over the decryptors. I weakened and bought an iPhone a few years back; keeping that thing even relatively "open" is a nightmare. We have open-source software but open-source hardware is a different matter. Raspberry Pi is an encouraging but tiny step. ... except that Rasperry Pi is based on a locked down Broadcom platform where the closed-firmware GPU with closed (now open but very limited) driver is in control, and the CPU only gets to do what the GPU says. I don't find it particularly exciting compared to mini-ITX or other more open solutions.